The Miracle of the Gaderene Swine. Briton Riviere, RA (1840-1920). 1883. Oil on canvas. Measurements: 107.9 x 160.7 cm. Accession number: N01515. Tate Gallery. Acquisition method: Presented by Sir Henry Tate in 1894. Image available on the Tate website for sharing and reuse on the CC BY-NC-ND (Creative Commons Attribution-NonCommercial-NoDerivatives) licence [click to enlarge the images]. Commentary by Jacqueline Banerjee. Simon Reynolds numbers this among Riviere's "[o]utstanding biblical and classical works," and it does give a panoramic view of a host of dark, demonic-looking swine tumbling over the edge of the cliff, trampling one fleeing shepherd and sending another, and the sheepdog, pelting away for safety. 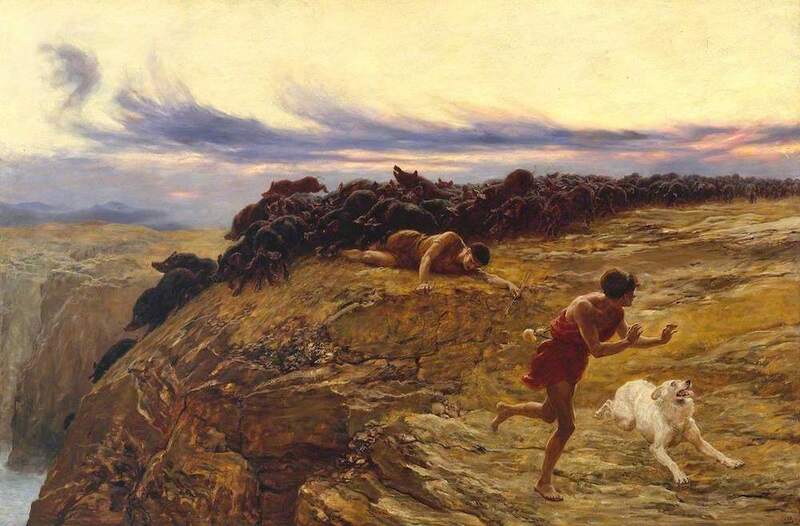 This dramatically depicts the miraculous episode in Luke 8, v. 26-39, in which Jesus is said to have released devils that had plagued a demented man, and sent them into a herd of swine instead: "Then went the devils out of the man, and entered into the swine: and the herd ran violently down a steep place into the lake, and were choked. When they that fed them saw what was done, they fled, and went and told it in the city and in the country" (33-34). The lowering sky with its touches of flame-red and violet is perfect here, but most impressive is the host of swine, each seemingly an individual in itself, and the terror of the shepherds and their dog. The rocky cliff too is masterly in its detail, showing the variations of its strata. The ground almost seems to be cracking under the pressure. "Briton Riviere: The Miracle of the Gaderene Swine." Tate. Web. 7 October 2018. Reynolds, Simon. "Riviere, Briton (1840–1920), painter." Oxford Dictionary of National Biography. Web. 7 October 2018.